Marc and Philipp got to know each other in a student corridor in Sweden when Philipp tried to knick Marc’s vacuum cleaner. 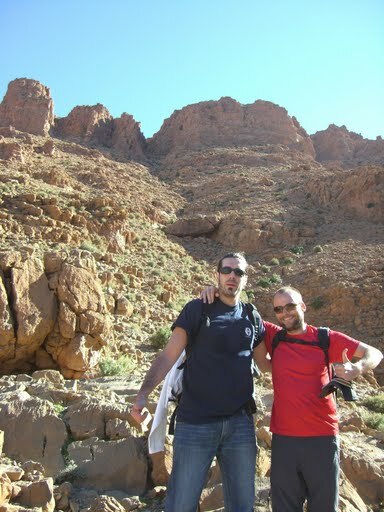 Since then, they became friends, and even got lost in Morocco together. After a 4 1/2 year stint studying and working at Växjö University, Sweden – 3 1/2 years working with CeLeKT, the CEnter of LEarning and Knowledge Technology, Philipp decided that he prefers the mediterranean than the nordic colds. When he and Marc are not thinking about projects, he’s enjoying Spanish food and sun while working as a software architect for T-Systems. In 2005, Marc a computer science student from the warmest Barcelona (Spain) went to Sweden during an Erasmus exchange program to experience nordic weather and watch the northern lights. After that, he finished his deegree and worked as PHP developer and then as researcher. When he and Philipp are not thinking about projects, he’s playing basketball, writing his travel blog or travelling around. Miguel is from Argentina, since 10 years ago he dreams how to design interactive interfaces besides software or harware. So, he moved to Barcelona following this design love in order to improve his knowledge and work with new technologies. Visit his portofolio!